The Howdy Houston release planned some years ago didn't show up. However this CD features the same concert under the same title. We're talking about a soundboard release from June 1975. Like the other soundboards from this specific tour this isn't a complete one. It's starts in 'Amen' (I Got A Woman/Amen). Tagged on the end is 'Can't Help Falling In Love' from Kalamazoo, April 26 1977. This should have been included on the soundboard release called Memories From Kalamazoo, but was excluded for some reason. This marks the fourth release from Lone Star. And the third focusing on Elvis' tour number 14 starting in Huntsville, Alabama May 30 and ending in Memphis, Tennessee June 10 1975. This specific tour has always been one of my favorites, as it in general displays a happy and vital Elvis performing on stage. As one could expect there are only minor differences in the song line-up between the shows, after all it was a 12 days tour only. And Elvis stayed in the same mood more or less through the whole tour, a high and delightfully relaxed such! "Howdy Houston" has been an all too familiar title for almost two years. The initial release never became, but Lone Star finally took the task and released the show. They stayed with the same title. As far as I can dig out, all concerts during tour number 14 was recorded from the mixing console, and all of the soundboards are incomplete. In general they lack the first numbers, 'Also Sprach Zarathustra', 'See See Rider' and 'I Got A Woman', but some contain the beginning while the end is cut off. The soundboard used for Howdy Houston falls in between these two categories, which means that the tape starts in 'Amen' and ends after 'Funny How Time Slips Away'. Otherwise it's complete, also during the band introduction. Releases from the Lone Star label have two characteristics. They feature soundboards in good quality, but unfortunately they're all presented in a rather cheap way. The artwork is rotten, and the CD itself looks almost like a CD-R, although it isn't. My advice is that Lone Star spends more time and effort on their future releases. An attractive presentation can sometimes be a reason good enough to buy a CD. So if the CD's content does not appeal sufficiently the artwork could be deciding whether you buy or not. The sound quality on Howdy Houston is almost equal to Dallas Seventy-Five. Of special qualities one could point out the horn section, which is very prominent. No big deal, but a nice experience all the same. Cut to the chase - except for two songs this show offers nothing of high interest. It's almost a carbon copy of e.g. The Eyes Of Texas Are Upon You (Houston, June 4) and Dallas Seventy-Five (Dallas, June 6). The two songs worth mentioning specifically are 'Trying To Get To You' and 'You Gave Me A Mountain'. Both are really strong deliveries, as usual when Elvis decided to do something a little different. Although Elvis fans have literally hundred different versions of 'You Gave Me A Mountain', there are not many from early 1975. Since Elvis had not performed this song on regular basis for a while, the band went back to the "original" tempo. Therefore it reminds quite a lot of versions from 1972. Also 'Trying To Get To You' is performed slower than usual, to great effect. Elvis' tendency to rush songs often disturbed the total impression, so it's nice to hear some "slow" renditions in between. I have read other reviews of this concert, and they all seem to find that Elvis was in rather short breath this day, thus performing many songs below par. I do not agree! Certain songs are definitely thrown away, but not more this day than common for the tour, or in general for that matter. I especially dislike versions of 'The Wonder Of You' during 1975. What a total waste of talent! Sure, 'Hound Dog', 'Teddy Bear' etc. could be included on this "waste-list", but that's another story. With 'The Wonder Of You' the fact is that Elvis never performed this song with serious intentions after August 1970, when it was still a new song. We're told that 'T-R-O-U-B-L-E' from this concert was used for the Silver box. That is probably right, but at least RCA had to remove some female voice from Elvis first (listen on "...mercy"). By the way, 'T-R-O-U-B-L-E' starts the strong part of this concert. Five other demanding songs follow it...and still two of them get a reprised ending. As far as I can judge, this is one of the strongest 20 minutes presented in a 1975 concert ever! It must have been a relief to switch over to 'Little Darling' after such a "power" period! Tagged on the end is 'Can't Help Falling In Love/Closing Vamp' from Kalamazoo, April 26 1977. A soundboard was released on Memories From Kalamazoo some time ago. However, this particular song was not included back then and therefore make its debut here. Howdy Houston marks the 7th soundboard release from tour number 14. With "A Capital Performance" also out, it means that 9 soundboards are left. Several Elvis fans are eagerly awaiting a soundboard release from Huntsville also. Time will show. 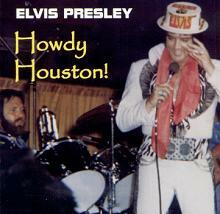 Howdy Houston, however contains a fine 1975 concert in good sound; sure it deserved a nicer wrapping! © Oven Egeland, Elvis In Norway, July 2002. Go here for Focus On Elvis In June 1975.